* Song of Songs 3:6 "Who is this coming up from the desert like a column of smoke, perfumed with myrrh and incense made from all the spices of the merchant?" * Song of Songs 3:7-8 "Look! It is Solomon's carriage, escorted by sixty warriors, the noblest of Israel, all of them wearing the sword, all experienced in battle, each with his sword at his side, prepared for the terrors of the night." * Joel 2:11 "The LORD thunders at the head of his army; his forces are beyond number, and mighty are those who obey his command. The day of the LORD is great; it is dreadful. Who can endure it?" * Revelation 19:11-16 "I saw heaven standing open and there before me was a white horse, whose rider is called Faithful and True. With justice he judges and makes war. His eyes are like blazing fire, and on his head are many crowns. He has a name written on him that no one knows but he himself. He is dressed in a robe dipped in blood, and his name is the Word of God. 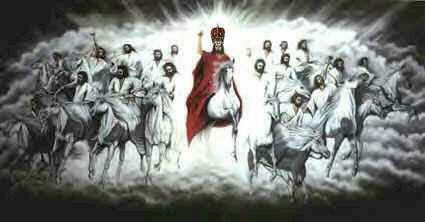 The armies of heaven were following him, riding on white horses and dressed in fine linen, white and clean. Out of his mouth comes a sharp sword with which to strike down the nations. "He will rule them with an iron scepter." He treads the winepress of the fury of the wrath of God Almighty. On his robe and on his thigh he has this name written: KING OF KINGS AND LORD OF LORDS." * The apostle John (and other apostles) describes a similar scene when Jesus comes again with his angles and saints following. Joel is most likely describing the same thing that they foretold. * Matthew 16:27 "For the Son of Man is going to come in his Father's glory with his angels, and then he will reward each person according to what he has done." * Matthew 24:27-31 "For as lightning that comes from the east is visible even in the west, so will be the coming of the Son of Man. Wherever there is a carcass, there the vultures will gather. Immediately after the distress of those days "'the sun will be darkened, and the moon will not give its light; the stars will fall from the sky, and the heavenly bodies will be shaken.' At that time the sign of the Son of Man will appear in the sky, and all the nations of the earth will mourn. They will see the Son of Man coming on the clouds of the sky, with power and great glory. And he will send his angels with a loud trumpet call, and they will gather his elect from the four winds, from one end of the heavens to the other." * Matthew 25:31-33 "When the Son of Man comes in his glory, and all the angels with him, he will sit on his throne in heavenly glory. All the nations will be gathered before him, and he will separate the people one from another as a shepherd separates the sheep from the goats. He will put the sheep on his right and the goats on his left." * Matthew 26:63-64 "But Jesus remained silent. The high priest said to him, "I charge you under oath by the living God: Tell us if you are the Christ, the Son of God." "Yes, it is as you say," Jesus replied. "But I say to all of you: In the future you will see the Son of Man sitting at the right hand of the Mighty One and coming on the clouds of heaven." * The exchange in Matthew 26:63-64 is also in Mark 13:26, 14:62; Luke 9:26, 21:27. Mark 14:61-62 "But Jesus remained silent and gave no answer. Again the high priest asked him, "Are you the Christ, the Son of the Blessed One?" "I am," said Jesus. "And you will see the Son of Man sitting at the right hand of the Mighty One and coming on the clouds of heaven." * Zechariah 9:14-15 "Then the LORD will appear over them; his arrow will flash like lightning. The Sovereign LORD will sound the trumpet; he will march in the storms of the south, and the LORD Almighty will shield them. They will destroy and overcome with slingstones. They will drink and roar as with wine; they will be full like a bowl used for sprinkling the corners of the altar." * Acts 1:11 "Men of Galilee," they said, "why do you stand here looking into the sky? This same Jesus, who has been taken from you into heaven, will come back in the same way you have seen him go into heaven." * See a paining of Jesus Coming in Glory with his army following him to the right. * Song of Songs 3:9-10 "King Solomon made for himself the carriage; he made it of wood from Lebanon. Its posts he made of silver, its base of gold. Its seat was upholstered with purple, its interior lovingly inlaid by the daughters of Jerusalem." * Song of Songs 4:1-3 "How beautiful you are, my darling! Oh, how beautiful! Your eyes behind your veil are doves. Your hair is like a flock of goats descending from Mount Gilead. Your teeth are like a flock of sheep just shorn, coming up from the washing. Each has its twin; not one of them is alone. Your lips are like a scarlet ribbon; your mouth is lovely. Your temples behind your veil are like the halves of a pomegranate." * Song of Songs 4:4-5 "Your neck is like the tower of David, built with elegance; on it hang a thousand shields, all of them shields of warriors. Your two breasts are like two fawns, like twin fawns of a gazelle that browse among the lilies." * Song of Songs 4:6-8 "Until the day breaks and the shadows flee, I will go to the mountain of myrrh and to the hill of incense. All beautiful you are, my darling; there is no flaw in you. Come with me from Lebanon, my bride, come with me from Lebanon. Descend from the crest of Amana, from the top of Senir, the summit of Hermon, from the lions' dens and the mountain haunts of the leopards." * Song of Songs 4:9 "You have stolen my heart, my sister, my bride; you have stolen my heart with one glance of your eyes, with one jewel of your necklace." * Song of Songs 4:10 "How delightful is your love, my sister, my bride! How much more pleasing is your love than wine, and the fragrance of your perfume than any spice!" >How is this true of God the Father and our Lord Jesus Christ? * Song of Songs 4:11 "Your lips drop sweetness as the honeycomb, my bride; milk and honey are under your tongue. The fragrance of your garments is like that of Lebanon." * Psalm 8:1-2 "O LORD, our Lord, how majestic is your name in all the earth! You have set your glory above the heavens. From the lips of children and infants you have ordained praise because of your enemies, to silence the foe and the avenger." * Psalm 34:1-3 "I will extol the LORD at all times; his praise will always be on my lips. My soul will boast in the LORD; let the afflicted hear and rejoice. Glorify the LORD with me; let us exalt his name together." * Psalm 51:15 "O Lord, open my lips, and my mouth will declare your praise." * Ephesians 5:19-20 "Speak to one another with psalms, hymns and spiritual songs. Sing and make music in your heart to the Lord, always giving thanks to God the Father for everything, in the name of our Lord Jesus Christ." * Hebrews 13:15 "Through Jesus, therefore, let us continually offer to God a sacrifice of praise--the fruit of lips that confess his name." >6. What does the king compare his bride to in verses 11 and 15? * Song of Songs 4:12 "You are a garden locked up, my sister, my bride; you are a spring enclosed, a sealed fountain." * Song of Songs 4:15 "You are a garden fountain, a well of flowing water streaming down from Lebanon." * Song of Songs 4:13-14 "Your plants are an orchard of pomegranates with choice fruits, with henna and nard, nard and saffron, calamus and cinnamon, with every kind of incense tree, with myrrh and aloes and all the finest spices." * "pomegranates" -A pomegranate is a chambered, many-seeded, globose fruit, having a tough, usually red rind and surmounted by a crown of calyx lobes, the edible portion consisting of pleasantly acid flesh developed from the outer seed coat. * "henna" -Henna is an Asian shrub or small tree, Lawsonia inermis, of the loosestrife family, having elliptic leaves and fragrant flowers. * "nard" -Nard is an aromatic Himalayan plant, believed to be the spikenard. It is the source of an ointment used by the ancients. * "saffron" -Saffron is a plant having showy purple flowers. From it is made an orange-colored condiment consisting of its dried stigmas, used to color and flavor foods also called vegetable gold. * "calamus" -Calamus is any of various tropical Asian palms of the genus Calamus. Some are a source of rattan, its tough stems used in wickerword. It has an aromatic root. * "cinnamon" -Cinnamon is the aromatic inner bark of any of several East Indian trees belonging to the genus Cinnamonum, of the laurel family, especially the bark of C. zeylanicum (Ceylon cinnamon). Cinnamon is still a very common spice. It was also a used in medicine as a cordial and carminative. * "myrrh" -Myrrh is an aromatic resinous exudation from certain plants of the genus Myrrhis, a small spiny tree. It has been and still is used for incense and perfume for the living and dead. Mryyh in Israel was known as the gift for a prophet. * "aloes" -Aloes are any chiefly African shrub belonging to the genus Aloe, of the lily family, certain species of which yield a fiber. * Ephesians 6:18 "And pray in the Spirit on all occasions with all kinds of prayers and requests. With this in mind, be alert and always keep on praying for all the saints." * Revelation 5:8 "And when he had taken it, the four living creatures and the twenty-four elders fell down before the Lamb. Each one had a harp and they were holding golden bowls full of incense, which are the prayers of the saints." * Revelation 8:3-4 "Another angel, who had a golden censer, came and stood at the altar. He was given much incense to offer, with the prayers of all the saints, on the golden altar before the throne. The smoke of the incense, together with the prayers of the saints, went up before God from the angel's hand." * Song of Songs 4:16 "Awake, north wind, and come, south wind! Blow on my garden, that its fragrance may spread abroad. Let my lover come into his garden and taste its choice fruits." * John 15:16-17 "... You did not choose me, but I chose you and appointed you to go and bear fruit--fruit that will last. Then the Father will give you whatever you ask in my name. This is my command: Love each other." * Galatians 5:22-26 "But the fruit of the Spirit is love, joy, peace, patience, kindness, goodness, faithfulness, gentleness and self-control. Against such things there is no law. Those who belong to Christ Jesus have crucified the sinful nature with its passions and desires. Since we live by the Spirit, let us keep in step with the Spirit. Let us not become conceited, provoking and envying each other." * Colossians 1:6b, 10 "All over the world this gospel is bearing fruit and growing, just as it has been doing among you since the day you heard it and understood God's grace in all its truth... And we pray this in order that you may live a life worthy of the Lord and may please him in every way: bearing fruit in every good work, growing in the knowledge of God"
* Romans 7:4-6 "So, my brothers, you also died to the law through the body of Christ, that you might belong to another, to him who was raised from the dead, in order that we might bear fruit to God. For when we were controlled by the sinful nature, the sinful passions aroused by the law were at work in our bodies, so that we bore fruit for death. But now, by dying to what once bound us, we have been released from the law so that we serve in the new way of the Spirit, and not in the old way of the written code." * Luke 3:8-9 "Produce fruit in keeping with repentance. And do not begin to say to yourselves, 'We have Abraham as our father.' For I tell you that out of these stones God can raise up children for Abraham. The ax is already at the root of the trees, and every tree that does not produce good fruit will be cut down and thrown into the fire." * John 15:1-8 "I am the true vine, and my Father is the gardener. He cuts off every branch in me that bears no fruit, while every branch that does bear fruit he prunes so that it will be even more fruitful. You are already clean because of the word I have spoken to you. Remain in me, and I will remain in you. No branch can bear fruit by itself; it must remain in the vine. Neither can you bear fruit unless you remain in me. "I am the vine; you are the branches. If a man remains in me and I in him, he will bear much fruit; apart from me you can do nothing. If anyone does not remain in me, he is like a branch that is thrown away and withers; such branches are picked up, thrown into the fire and burned. If you remain in me and my words remain in you, ask whatever you wish, and it will be given you. This is to my Father's glory, that you bear much fruit, showing yourselves to be my disciples." >8. How did the bridegroom show his joy? * Song of Songs 5:1 "I have come into my garden, my sister, my bride; I have gathered my myrrh with my spice. I have eaten my honeycomb and my honey; I have drunk my wine and my milk. Friends Eat, O friends, and drink; drink your fill, O lovers."